Wernher von Braun's sketch of a three-stage rocket used to transport a satellite to orbit, to be auctioned off by Bonhams. 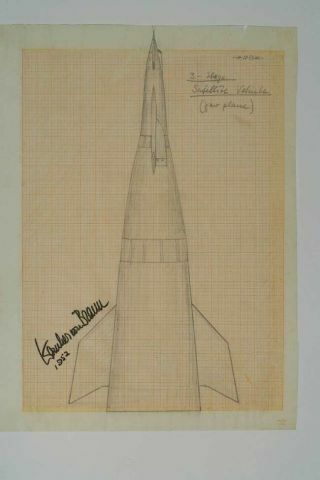 Sketches, diagrams, and letters from the pioneering rocketscientist Wernher von Braun will be auctioned off Wednesday. German-born Von Braun is most famous in America for leading theproject to design the rockets, including theSaturn V, that enabled America to land on the moon. Bonhams auction agency in New York will auction 35 documentsvon Braun created for a series of articles called "Man Will Conquer SpaceSoon!" that ran in Collier's magazine between March 22, 1952 and April 30,1954. Some of the plans and sketches, such as a diagram of a three-stagesatellite vehicle, were created as source material for illustrationsaccompanying the article. The whole collection is estimated to value between$15,000 and $25,000. "Reading von Braun's thoughts and speculations on thefuture of space travel and seeing his handwritten diagrams and sketches, someof which are surprisingly basic, is rather amazing and a clear testamentto his spirit of exploration," said Bonhams spokesperson Staci Smith. Despite his significant contributions to America's spaceprogram, von Braun's legacy is clouded by his association with Germany's NaziParty during World War II. He led the teamthat developed Germany's V-2 rocket weapon, and was an honorary officer in Hitler'sSS police force. After the war, von Braun and members of his German rocketteam immigrated to America, and von Braun became a U.S. citizen in 1955. Hejoined NASA and served as the first director of NASA's Marshall Space FlightCenter in Huntsville, Ala., helping to guide America's quest for the moon andinspire public support for the space program.